Pillars and roundels surround this ornate text in purples, blues and burgundies, reflecting the designs and sensibilities of Persia. This text is designed for couples from different heritages. 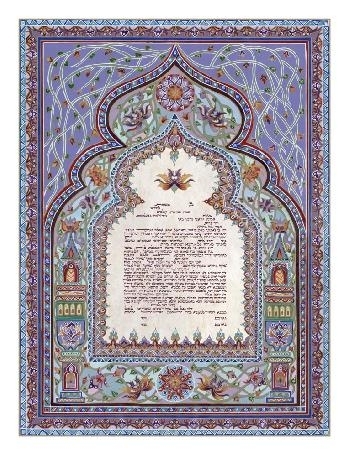 The language is gender neutral, sotubah when we personalize it according to the specifications of the couple. 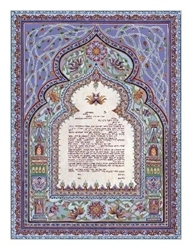 Most couples opt for the standard signature lines (2 Witnesses, Bride, Groom, and Rabbi) and commitment.